I loved picking out gifts for my sister and my bestie, who were my Maid of Honor & Matron of Honor. Once I started finding things, I just couldn't stop buying for them! The nice thing about having a small bridal party, is that I could splurge a little on what I got them. My fav thing that I got them was a new wallet from Kate Spade. I picked one for each of them that best matched their style, and I went on from there to build the perfect gift bag. Since our wedding was less than seven weeks away when I got the chance to even ask my sister and bestie, I didn't have time to wait for this card to come in. If I had the time to wait, I totally would have gotten them these! Instead, when I gave them all of their gifts at the rehearsal dinner, I included these darling thank you notes. Why not get your maids something they can actually make use of?! I am obsessed with this blush necklace from J.Crew. 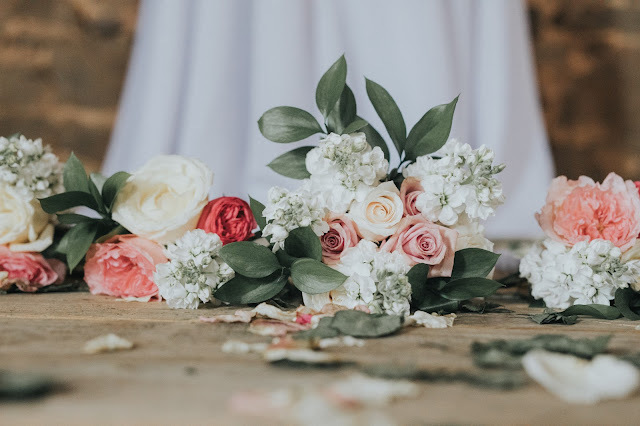 My MOH's dresses didn't really allow for a necklace like this to wear in the wedding because of the romantic style I was going for, but statement necklaces are becoming a huge trend for maids and even brides to wear during the wedding! I love, love, love Ashley Brooke Designs. If you've never heard of her, you should totally check her out. I saw these water bottles and thought that "Best Day Ever" was simply perfect for a maids gift. After all, they are taking part in your best day ever. Another added bonus: It's actually functional! If you were to give this as a proposal gift, they'd have a water bottle to drink from as they are slaving away---er I mean helping you with wedding duties. I have had this wallet in so many colors. It's slim but it holds a lot. Kate Spade has so many different styles and color & pattern options for their wallets that you will surely find something your girls will love! This wristlet is part of Kate Spade's wedding collection. I would say this is more for your stylish/fashionista friend that keeps up with the trends. But I mean, how cute is it?! Wristlets are a perfect gift, no matter what style, because they can have it handy on the wedding day packed full of emergency goodies. These studs are perfect for your squad to wear on your wedding day. I have a pair very similar to the crystal style that I wear all the time because they go with everything--dressy & casual. Give your maids something that they will be able to wear again, and again. I couldn't find the exact totes that I got online because I miraculously found mine at Home Goods a week before my wedding, but I linked similar ones for you. I put all of their gifts wrapped up in their totes--I was even able to find ones for my Mom & my MIL! I am so glad that I got them because on my wedding day, they came in handy. Everyone packed up their bag with their shoes, emergency items, jewelry, and more to make sure they were bringing everything over to the barn that they needed! So, I can proudly say that I wasn't a bridezilla at all...that I know of. haha! BUT, in case you drive your wedding party crazy, you know they'll be alright. I totally recommend giving them this as a proposal gift so they have it in time for the week before the wedding. They're probs gonna need it. I don't know about you, but I love candles. Chris and I always have candles burning in the house because it makes it smell just so dang good. I got my girls candles from Marshalls, but I totally wish that I had thought to go to B&BW and get them a 3-wick! Even if your peeps don't like burning candles all that often, they make for a gorg decoration! You totally don't have to get all of these gifts--that would cost you a fortune! But, here are some ideas to get you jump started on your wedding planning adventures. 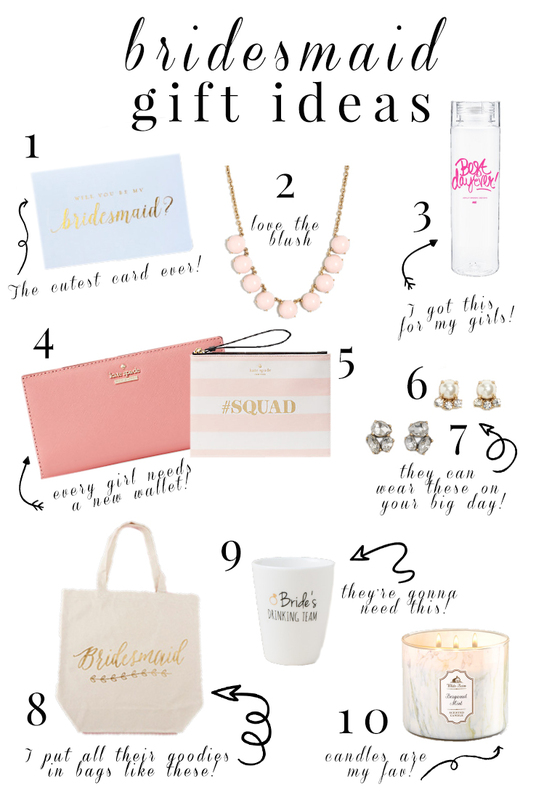 If you're already married, what gifts did you get for your Bridesmaids? If you've been a Bridesmaid, what gifts did you receive?